J-011 Joystick Math module for eurorack / Doepfer A100 system. Two inputs (named X and Y like axes but can be used for any two CV or audio signals, not for J-010 Joystick only). With this “splitter” function you can drive for example VCF frequency at upper joystick position and LFO frequency at lower joystick position (for example), both with positive CV outs. 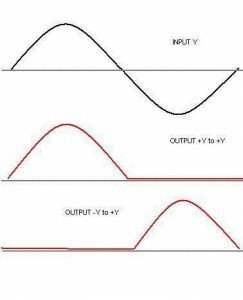 This splitting allows two functions control by one axis, one for positive joystick movement and second for negative movement, on both outputs from 0V to positive voltage. 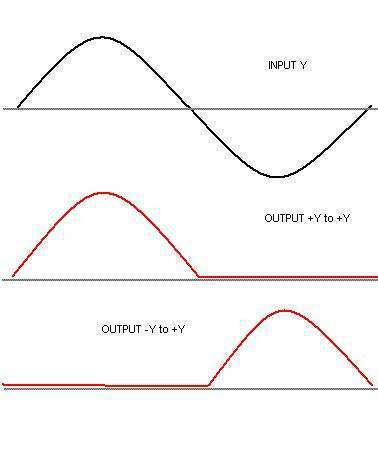 If you´ll feed an input signal into Y input (forget joystick, just an signal for example sine), you can feed output form an “Y to Y” to X input.